Dr. Deirdre Hamaker earned her Doctorate in Audiology from the University of South Florida. She earned her Bachelor of Science in Health Policy Management from Providence College in Rhode Island. In addition to her audiological training at USF, she completed a one year externship at James A. Haley Veterans Administration where she gained experience in assessment and treatment with geriatrics and poly-trauma patients. She also completed tinnitus research and treatment at this facility. Her complete training includes comprehensive audiological evaluations, hearing aid programming using the latest technology, bone anchored hearing aid programming, electronystagmography (ENG), vestibular autorotation (VAT), auditory brainstem response (ABR), Electrocochleography (EcochG), Vestibular Evoked Myogenic Potentials (VEMP), tinnitus evaluation and treatment, cochlear implant candidacy evaluations, and post implant programming. 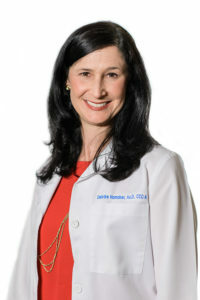 Dr. Hamaker is licensed in the state of Florida and she is a member of the American Academy of Audiology and of the American Speech Language hearing Association.